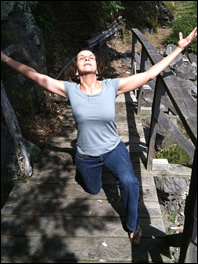 My passion for yoga and teaching comes out of my own experience of healing, self-understanding, improved well-being, and joy resulting from yoga practice and study. This work has convinced me that no matter the age or condition or situation of a person, yoga provides practices that fit the individual and offers the possibility of profound positive change. Vedic Chant Immersion & Teacher Training, Certificate of Completion, 2014. 500-hour Yoga teacher Training Certificate, Yoga for Well-being, 2010. Yoga Teacher, 2001-present including TMC, Wellness through Movement, Susquehanna Township Recreation, HACC, local business and church settings. Master of Arts, Humanities, Penn State University, 1998.